Given the likelihood that the natural move when looking at an Allen Toussaint set exploring his influences would be to place the man in a Crescent City studio with an outfit drawn from New Orleans’ finest instrumentalists it makes sense, at least from where I’m sitting, for producer Joe Henry to head out of town and cut the album with a group of highly rated New York session players and guest artists. The Bright Mississippi isn’t Toussaint’s first excursion into the world of jazz, but given the limited distribution of 2005’s Going Places, released on a small label run by his son, it might as well be. 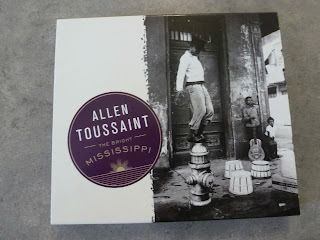 It also acts as the follow-up to Toussaint's high-profile 2006 album with Elvis Costello, The River in Reverse (also produced by Joe Henry). That time they used Costello’s Imposters alongside an array of New Orleans instrumentalists, but here there’s a horn section that approximates modern jazz royalty (trumpeter Nicholas Payton, whose father played bass on Lee Dorsey’s Working In A Coal Mine and clarinetist Don Byron), a stellar rhythm section (David Pilch on upright bass and Jay Bellerose, drums) with Marc Ribot, in all-acoustic mode on guitar. With Toussaint on piano and guest appearances from pianist Brad Mehldau and saxophonist Joshua Redman that’s the instrumental lineup sorted. As far as the material is concerned we’re looking at covers of classic pieces by Jelly Roll Morton (Winin' Boy Blues), Sidney Bechet (Egyptian Fantasy), Louis Armstrong (King Oliver’s West End Blues), Duke Ellington (Day Dream and Solitude), Django Reinhardt (Blue Drag), Thelonious Monk (The Bright Mississippi) alongside the traditional St. James Infirmary and Just A Closer Walk With Thee and Leonard Feather’s Long, Long Journey. Sidney Bechet’s Egyptian Fantasy comes across as a brassy jazz funeral march, Byron's clarinet and Payton’s trumpet ragging around each other before a Toussaint piano solo over a barely audible tambourine in the background. Dear Old Southland riffs off Summertime throughout, opening with Payton playing a Dixie lament over Toussaint’s piano before another unaccompanied piano solo with Payton coming back soft and eloquent to round off an impressive six plus minutes. The rolling piano in St. James Infirmary swings over Piltch's upright bass, Ribot's acoustic guitar and Bellerose's percussive punctuation, Ribot gets a solo and there’s an immaculately executed call and response to and fro around the main theme as Toussaint’s piano prodding Ribot's guitar on the way out. Payton's back in the foreground for Singin’ the Blues with the rhythm section right on his heels and Toussaint comping along behind in a version that could have come straight out of Preservation Hall, and Jelly Roll Morton’s Winin’ Boy Blues is reworked as a piano duet with Brad Mehldau joining Toussaint behind the ivories. Mention King Oliver’s West End Blues to anyone who knows their traditional jazz and the immediate response will probably mention Louis Armstrong and, predictably, Payton’s trumpet brings New Orleans’ most famous musical ambassador to mind from the opening five-note theme. Toussaint’s piano underpins the whole exercise and Ribot’s guitar is crisp and concise, as it is on Blue Drag, which, of course, it should on a Django Reinhardt number. Byron’s clarinet takes the lead on the traditional Just a Closer Walk with Thee, with just a hint of playfulness as the stride piano plays off the gospel patterns as the clarinet loops back and forth across the top. Thelonious Monk’s Bright Mississippi gets a down home treatment, with a touch of funk in the second-line drum groove and a buoyant strut in the horn arrangement. There’s none of that in Joshua Redman’s tenor sax on Duke Ellington and Billy Strayhorn’s Day Dream, which gets the three-in-the-morning smoke-filled night club yearning treatment as Toussaint and Redman play off each other. The album’s only vocal arrives in Leonard Feather’s Long, Long Journey, a weary blues with muted trumpet over a brushed snare drum stroll with slide guitar, subtle and understated and eases gently into Duke Ellington’s Solitude, a late night duet involving Ribot’s guitar and Toussaint’s piano picking their way around the theme in five and a half minutes of stop-start interplay. It makes for an elegant finale to an exceptional outing. Cut live in the studio over four days (and it definitely sounds that way) The Bright Mississippi delivers a neat and innovative exploration of modern and traditional jazz elements that casts a glance back to the music’s roots and still sounds contemporary, delivers soul with elegance, and matches a good time feel with supper club sophistication. It’s a class effort that underlines the riches of the New Orleans tradition by taking the material, filtering it through one of the city’s musical giants and rolling it out through an instrumental outfit familiar with the feel but not bound by the musical geography. It’s an exercise one might definitely be tempted to repeat (and my music collection could definitely handle further explorations of the same themes in a similar manner) though one suspects lightning might not manage to repeat the strike location.